The Irish international trail runner breaks the 10 year-old record, while Hiko Tonosa and Catherina Mullan win National 10km road titles. Paddy O’Leary set a stunning new record of 16 hours 27 minutes 20 seconds for the Wicklow Round on Saturday (April 13). His time broke the 2018 17:09:44 mark set by Joe “Stringbean” McConaughey, who last year went quicker than the 10 year old record of 17:53:45 set by Eoin Keith in May 2009. The Wicklow Round, created in 2007 by mountain running veteran Joe Lalor, is a looped course covering 26 peaks totalling over 100km with over 6,000m climb. Navigation is by map and compass only. “A competitor must have sufficient resources and skills to survive in a mountain environment for the duration of the attempt,” states the rules. The aim is to run the lot in under 24 hours. After feedback from runners, a slightly shorter course knocked 18-20km off the original course, was first run in 2009. It starts and finishes at the Sally Gap and takes in all the big hills of Wicklow, most notably Lugnaquilla. 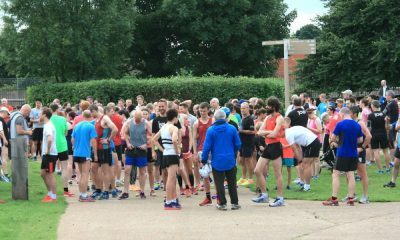 Before this weekend, a total of 21 attempts, some run by pairs and trios, had succeeded in breaking 24 hours on the current course. 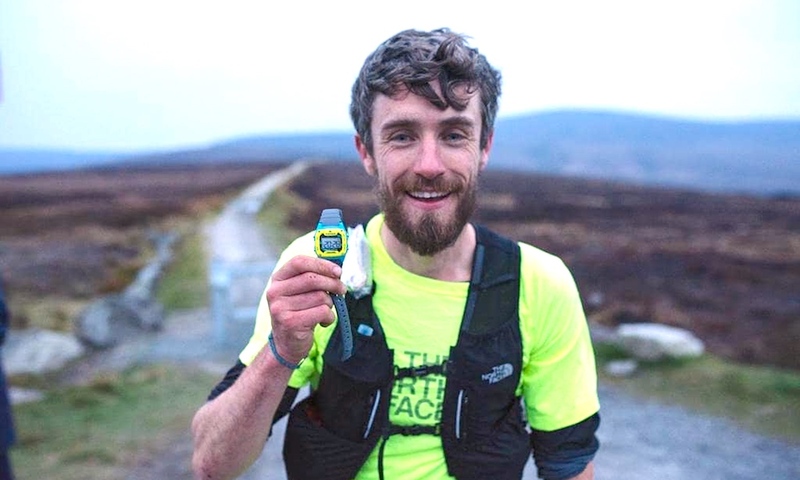 Joe “Stringbean” McConaughey is one of only three individuals to have finished in under 20 hours; the others being Adrian Hennessy who made it in June 2016 and Eoin Keith’s long standing record. Such is the spirit of the mountain running community in Ireland McConaughey was actually supported throughout by previous record holder Keith when he broke the record and O’Leary seems to have made a point of meeting and getting involved with the local running scene as well. “What an amazing adventure around the Wicklow Mountains,” said O’Leary afterwards on social media. “The conditions made for an interesting day, socked in with 50m visibility fog for the first nine summits, and a howling wind all day long that always seemed to be in my face (except for the last 2k of sprinting to the finish thankfully). Karina Jonina is the women’s record holder having run 22:37:43 in May 2017 when she broke Moire O’Sullivan’s 2009 record. There were four successful “rounds” in 2009 and then a gap until 2012 when just one attempt succeeded. There were two in 2013 and then another gap until 2015 when there were five successful attempts, followed by four in 2016, one in 2017 and four in 2018. That included a winter “round” last December by Paul O’Callaghan, who already has a summer round to his credit from 2016. O’Leary, an ex-Irish international lacrosse player, with sporting roots in Wexford GAA has enjoyed considerable success since taking up trail running after a move to the USA. He was top Irish finisher at the World Trail Championships in Spain last year and, on the roads, knocked off a 2 hrs 20 mins marathon. The Wicklow Round, he was hoping his first 18 years of “traipsing through the bogs of Bree searching for stray heifers” would stand to him on the day. They did! Eoin Keith meanwhile was at the other end of the earth a week earlier for the UTMB Ushuaia Fin del Mundo, Argentina, with races from 35km to 130km in distance taking place between April 5-7. Keith got a late entry for the 130km ultra on April 6 and was aiming for a podium finish in the M50 category. He duly finished second M50 and eighth overall in 17 hours 31 mins 16 secs. Winner was Jason Schlarb of the USA in 15:26.35. 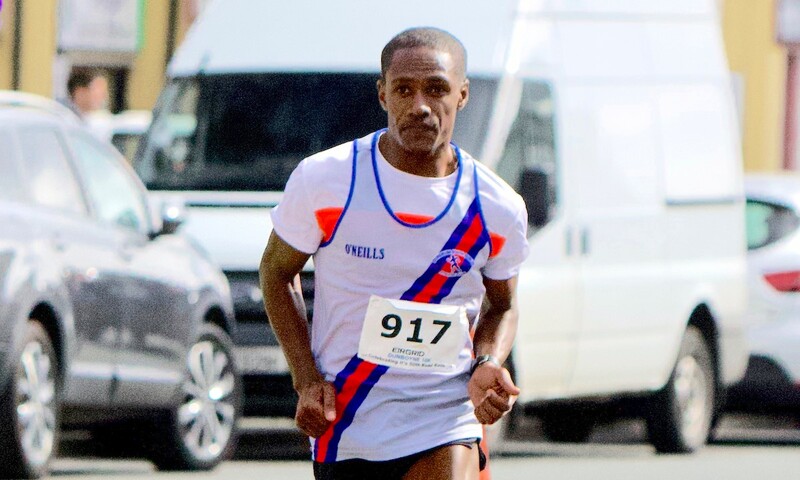 Hiko Tonosa of Dundrum South Dublin AC and Catherina Mullan from Metro St Brigid’s AC took the men and women’s titles at the National 10km Championships held in conjunction with the Great Ireland Run in Dublin’s Phoenix Park on Sunday (April 14). Tonosa and national cross country champion Kevin Dooney proved the class of the field in the men’s race, battling it out all the way to the line in bitterly cold conditions. In the end, Tonosa had the edge winning by three seconds in a time of 30:41 with Dooney clocking 30:44. Finishing third and first M45 was Declan Reed of City of Derry Spartans in 31:07. Conán McCaughey of North Belfast Harriers and Peter Arthur of Liffey Valley AC finished fourth and fifth and Peter Arthur of City of Derry Spartans sixth. Mullen won the women’s title in 34:52 with Barbara Cleary of Donore Harriers second and first W45 in 35:17 and Grace Lynch of Iveragh AC third in 35:32. In the master categories, Mayo AC’s Colette Tuohy was first W50, with her club mate PaulineMoran first W60. Winning the W55 age group was Niamh O’Sullivan of An Riocht AC. In the men’s master categories, Dermot Hayes of Dundrum AC was first M50, Paul Cowhie of Civil Service AC first M55, and Johnny Feery of Tullamore Harriers first M60. Best of the women’s senior teams were Mullingar Harriers, with Metro St Brigid’s second and Rathfarnham WSAF third. City of Derry Spartans took the men’s senior title ahead of North Belfast Harriers and Raheny Shamrock. In the well-supported master categories, Donore Harriers proved best of the over 35 women, followed by Mayo AC and Le Cheile AC; best W50 team was Mayo AC, who have dominated this category for a number of years. 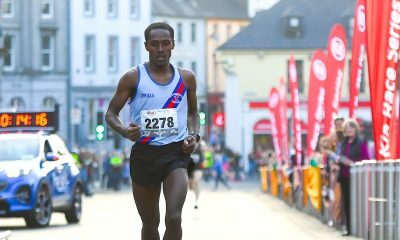 Rathfarnham WSAF not only had a clear win in the M35 age group, ahead of Newbridge AC and Sportsworld AC, but also won the M50 category, with Civil Service AC second and Mullingar Harriers third. 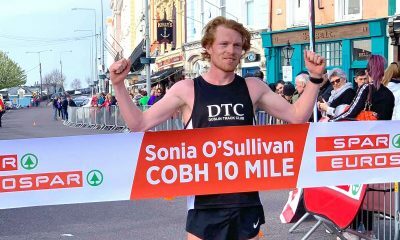 Winners of the Dromina 10 Mile in Co Cork on Sunday were Rory O’Connor of North Cork AC in 53:55 and Linda Byrne of Dundrum South Dublin AC in 63:23. 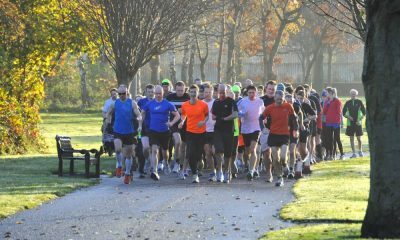 Donore Harriers’ Sinead Lambe ran 18:25 at the Malahide parkrun to record the fastest women’s time across Ireland on Saturday, while English runner Jon-Jo Doherty was the quickest man after running 16:20 at the Buncrana event in County Donegal.